As homeowners in the greater Salt Lake City Valley, the possibility of a gas leak can certainly be a scary thought. The inhalation of toxic fumes can be a danger to you, your family and pets as well as the potential for an explosion and needs to be taken care of immediately! Please take immediate precautions when you suspect a gas leak very seriously. Rotten egg smell – Many of us are familiar with that foul rotten egg smell that comes from natural gas. Hissing sounds – If you hear hissing or whistling sounds from a gas line. Dead vegetation in your yard – If you notice a patch of dead vegetation in your yard, this could be the result of a leaking gas line which could have been caused by extreme weather, ground shifting or normal wear and tear. The smell of rotten eggs is an obvious sign you have a gas leak. This could be a connection to a gas-powered appliance, a gas fireplace, water heater or coming even from outside the home. This is a good indication you may have a gas leak meaning gas is escaping from somewhere into your home. Avoid turning on any electronic device or anything that could create a spark and do not start your car if it is near the house. Do not use a lighter or any open flame or any electronic device hooked up to switches and outlets such as lights or appliances and leave the property immediately. Gas Leak Testing– to determine if there is a leak in the system. 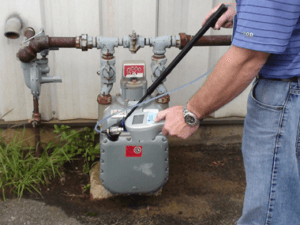 Gas Leak Detection – to detect and locate the gas leak. Once found, we will go over the options for the repair and provide you with an estimate. Gas Leak Repair – once the leak has been located, options have been discussed and you have given approval for us to move forward, we will get the leak repaired and get your gas back on for you as soon as possible. 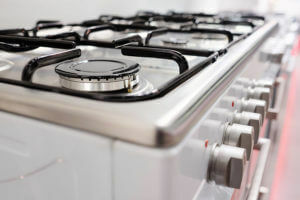 New Gas Line Installation – we can run gas to your new gas cooktop, oven or outdoor kitchen. We have the experience to make your dream a reality. Call or Contact Keemer Plumbing to have us come inspect for leak and we will come out to your home with our gas leak detector to find out where the gas leak is coming from. The professionals here at Kemmer Plumbing want to make sure you and your family are safe in the greater Kearns, West Valley, and Park City Utah metro areas of the Utah Wasatch Front!